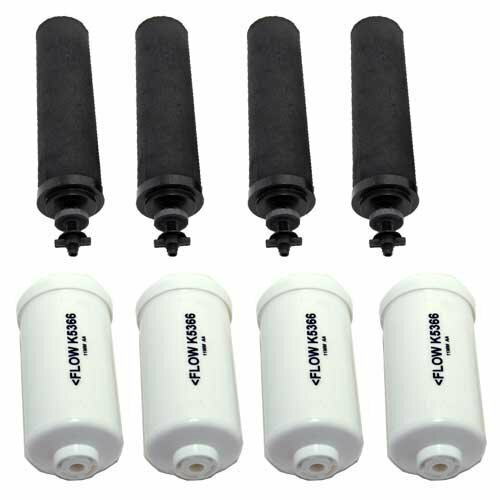 The Black Berkey filters (BB9) used in all Berkey systems take water filtration to a new level. During testing conducted by independent, EPA-approved laboratories, the Black Berkey filtered out a long list of water contaminants with never-before-seen results and significantly raised the standard for the water filter industry. As a result, Black Berkey filters are some of the most efficient filters that are currently available on the market. The Berkey water filter fluoride reduction elements (PF2) work by adding the ability to remove the following contaminants: Flouride, MBTE, Pre-oxidized Arsenic III and Arsenic V and other heavy metals. When threaded directly onto the Black Berkey® purification elements the fluoride reduction element is an effective way to take control of targeted harmful contaminants in your drinking water. These fluoride water filters work as a post filter to the Black Berkey and is compatible with all Berkey water filter systems. Black Berkey replacement filters will fit the following systems: Berkey Light, Big Berkey, Royal Berkey, Imperial Berkey, Crown Berkey, Travel Berkey. Berkey Fluoride Filters (PF2) attach to the Berkey Black filters (BB9) and reduce fluoride and arsenic. PF2 filters and are compatible with all Berkey water filter systems. Each Berkey filter element has a life of 3,000 gallons: That's an incredible 6,000 gallons for a two-filter system and 12,000 gallons for a four filter system! Each set of two Berkey PF-2 fluoride water filters should be replaced after 1,000 gallons (3,785 liters).